This luxurious caviar threaded barbell is made by Zircon Gold, of PVD coated G23 surgical titanium. The long 1.6mm stem and 6mm balls allow you to make sure your piercing does not get aggravated, as jewellery that is too small for a piercing can do this. It’s a good idea to measure where you need jewellery to fit so that you get just the right size as you don’t want it too large either due to the possibility of snagging. 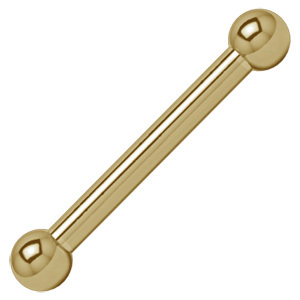 This caviar threaded eyebrow barbell is available in three different sizes, allowing you to fit your body shape best.